How do you manage student behavior? Having a strategic plan based on the type of behavior is key. Managing disruptive behavior is critical to creating an effective learning environment for your students. Learn how to improve behavior in your classroom today with these 16 management techniques and strategies. From annoying distractions to class clowns, get ideas on how to manage the most difficult behavior challenges you face with your students. Get instant ideas from other teachers on how to manage your toughest behavior challenges. Just click on a behavior issue below. How can a teacher prevent irritating classroom behaviors? 1. The students and teacher should first discuss and then write a "group" contract adopting acceptable classroom rules and procedures by the end of the first week of school. 2. Periodically review the rules and procedures of the classroom until the students can successfully adhere to them. 3. Use simple verbal reprimands when the misbehavior occurs. Make sure that they are to the point, moderate in tone, and private (e.g., "Stop talking and work on your math problems, please"). 4. Give praise to the entire class as frequently as possible (e.g., "Thank you for working so quietly, “or "I'm delighted to see you all working so well today"). 5. 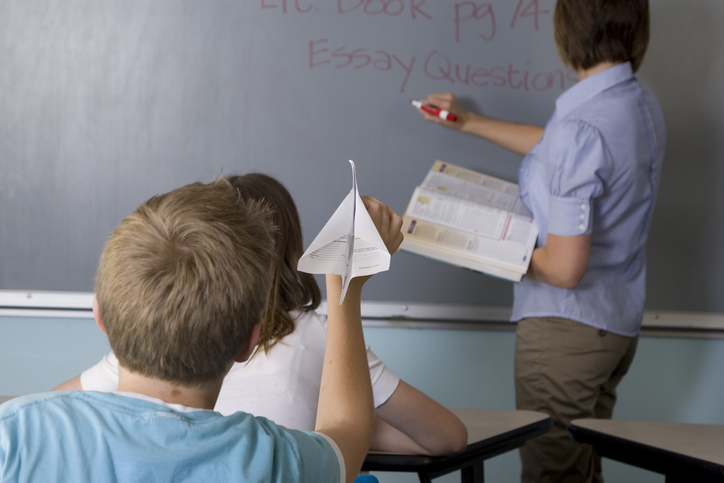 A student who continually exhibits an unacceptable behavior (e.g., out of his/her seat) might profit from an "individualized" contract pinpointing the "desired" behavior (e.g., remaining in his/her seat) and delineating the consequences (e.g., if goal is reached, then student will receive designated reward or recognition). 6. Intervene as soon as possible in order to prevent the misbehavior from occurring (e.g., say "Harry, may I help you with your assignment?" when the student begins to show signs of frustration). 7. Use facial expressions to convey to the student that the misbehavior was not totally overlooked. Circulate around the room frequently, to avert potential behavior problems. What can be done to help students improve their interaction with authority figures? 1. Provide opportunities for students to change their hostile and aggressive energy into socially acceptable channels such as sports, clubs, crafts, hobbies, etc. 2. Give students reading and/or writing assignments that deal with antagonistic behaviors, and ask them to comment on different socially acceptable ways of handling conflict situations. 3. Praise the students whenever they are cooperating with other adults (e.g., "That was very kind of you to help her find her keys"). 4. Talk to the student in private to ascertain the reason for his/her misbehavior. 5. Provide the students with models of appropriate communicative behavior through role-playing activities. 6. Encourage students to strive for greater self-control in as many situations as possible. 7. Emphasize to students the difference that exists between acceptable communication in school and that which is used at home and/or in the community. 8. Contact parents and/or administrators when there is no other way of resolving the conflict situation. 9. Refer the student to appropriate staff members (e.g., the Child Study Team, if the student frequently displays uncontrollable verbal hostility). Keep anecdotal records to support your concerns. How can the teacher deal with a child who becomes argumentative upon confrontation? 1. Do not confront the student in a group situation. 2. Do not use an accusatory tone upon approaching the student. 3. Evaluate the situation that led to the confrontation. 4. Do not back the student into a corner. Leave room for options. 5. Do not make threats that cannot be carried out. 6. Allow your emotions to cool before approaching the student. 7. Maintain the appearance of control at all times. Use a clear, firm voice. 8. Give the child an opportunity to speak his/her piece. 9. Allow for role-playing, doing role reversal. 10. Try to explore and discover what led to the confrontation. Avoid repeating these circumstances. 11. If you made an error, admit it! What steps can be followed to resolve a child's constant mis behavior? 1. If possible, meet with the child and describe in exact terms the behavior you find unacceptable in the classroom. 2. During the discussion, explain the reason(s) why you find the behavior unacceptable. 3. Be sure the child understands that it is not he/she who is unacceptable, but rather the behavior. 4. Let the student know exactly what will happen if the problem continues. 5. If the misbehavior occurs again, follow through with the previously planned disciplinary action. 6. Throughout the process, keep the parents and the principal informed of the progress or lack of progress. 7. If the child continues to misbehave and you feel that you have utilized all of your options and resources, send the child to the principal's office. Explain to the child that he/she is welcome to return when he/she is ready to follow the classroom rules. What can be done for a student who is constantly disrupting the class in order to gain the teacher's attention? 1. Give the student a position of responsibility in the classroom and encourage him/her to set a good example for others (e.g., passing out papers). 1. Raise your hand if you wish to talk. 2. Wait to be called on. 3. Listen while others talk. 3. Assign the student a special project of interest and let him/her present the report to the class. 4. Ignore the student's annoying comments, but give praise when the student describes his/her real achievements. 5. Assign the student to a small group in which he/she must participate primarily as a follower. 6. Provide recognition and positive attention whenever possible. 7. Model appropriate behavior every day for the student, so that he/she can see what is expected of him/her (e.g., role-playing by teacher and/or peers). 8. Arrange parent conferences to discuss any factors that may be contributing to the student's problem in school (e.g., sibling rivalry). What do you do with a student who calls out answers or comments during class? 1. Discuss your expectations with the class. Make up rules and consequences at the very beginning of the school year. 2. Keep a frequency record in your grade book of the calling out, and increase the severity of the consequence in direct proportion to the frequency of the "calling out." 3. With children in the middle grades and older, divide the class into two groups and make a game out of questions and answers. Each team scores a point for each correct answer. If a team member calls out an answer out of turn, that team loses a set amount of points. 4. Praise the student who does not call out, but waits to be called on. 5. Ignore the calling out. Do not acknowledge having heard it. 6. Use a strict behavior-modification program to lessen and ultimately extinguish this behavior. 7. Examine the reason for the calling out. Is it for attention? Do you tend to overlook calling on this student? Is the calling out a result of an inability to sit still? Does this child have a learning disability? React to these symptoms appropriately. 8. Contact the parents. Try an at-home reward system for good days (days in which calling outdid not occur). This will involve sending a note home daily. What can you do about children constantly calling out in class, even when they are supposed to be working quietly at their seats? 1. Be sure that the students know what you expect of them concerning this problem. Describe what procedure you want them to use to get your attention, and explain why they should not callout in class. 2. If students' calling out is a major problem, hold a class meeting and ask the children to make recommendations for solving this problem. This would include the type of discipline to be used for the children who continue to disturb the class by calling out. 3. Be consistent and persistent in disciplining the children who call out. 4. If a child communicates with you by calling out, make your only reaction one of displeasure and do not answer the question or fulfill the request. 5. Tell the class that if calling out in class only occurs a certain number of times during the week, you will do something special with them on Friday afternoon. Peer pressure is then utilized to solve the problem. In the weeks that follow, calling out will lessen, as students anticipate the special Friday activity. 6. Calling out may be motivated by the student's enthusiasm, or by the fear that he/she will forget what he/she wanted to say. Have students keep a pad and pencil on their desk to write down a thought they might forget. That way they can refer to it when they finally get called upon. Be sure to give everyone a chance to answer something -- even the slower thinking students! How can you deal effectively with a "class clown"? 1. Let the student know in private how you feel about his/her unacceptable behavior, and explain what is expected of him/her. Try to form a trusting relationship with this student. Listen to his/her feelings and expectations. Try to channel his/her talent for humor into something more productive, such as creating a class play or dramatic skit. 2. If you think it would be beneficial, try role-playing with this student. Give him/her the role of the teacher who is trying to teach a lesson. You take on the role of the class clown and exhibit the same behaviors that he/she does in class. This may be a learning experience for the entire class! 3. Explain to the student that the solution to his/her problem is his/her responsibility as well as yours. However, if the "class clown" behavior continues and it affects the level of learning for the rest of the class, then the responsibility for the solution will lie with him/her and the administration. 4. Try to find the curriculum areas in which the student is interested. Give him/her some independent work in these areas and observe any change in behavior. 5. Let the child gain the attention of the class in such a way that it has a positive effect on the class. The student could conduct mini-lessons, lead study groups, assist students, or make other contributions that will benefit the entire class. 6. Ask for the assistance of a counselor to investigate various possible reasons for the child's need to be the "class clown." How do you cope with a child who demands your constant attention? 1. Give this child a special job to show that you care about and have confidence in him/her. 2. Make this child the captain or leader whenever possible. 3. Play games that nourish self-confidence. For example, try the Circle Game: Have children sit in a circle and take turns naming someone in the circle who has done something to help or to make him/her feel good. 4. 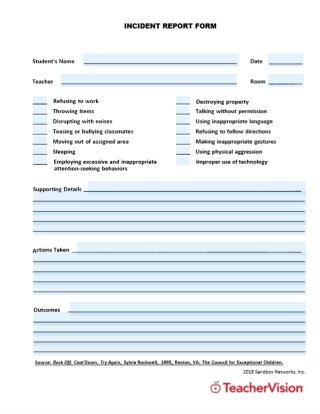 Use personal evaluation sheets. These can be as simple or as complex as you desire. In this way, you can help children express feelings and recognize their own strengths/weaknesses in a non-threatening atmosphere. 5. Provide a wide variety of classroom experiences. Familiarity breeds self-confidence! 6. Implement a buddy system for this child. 7. Check into the home environment. See what is motivating this dependency. 8. Frequently assign this child simple, easy tasks that allow for success. 9. Provide self-correcting tasks so that the child may see his/her own errors first hand. 10. Videotape your class in action and let the student (as well as the other students) actually see how he/she interacts in class. What can you do about a student who fails to ask for help with matters he/she does not fully understand in the curriculum or in the classroom in general? 1. For various reasons, the student may not feel comfortable or confident about asking questions in certain classroom settings. Have an individual conference with the student to discuss the problem. Work together to develop possible solutions. 2. If the student does not feel comfortable asking questions in the classroom setting, have him/her write the questions on a piece of paper or a 3x5 card. Then, when time permits, meet with the child individually to review the questions, or provide general answers to the class if you think others may have the same questions. 3. Designate other students in the classroom as resource persons, who can meet with the student and offer assistance. The student may be more apt to ask for help from a peer than from the teacher. 4. Consider having the child evaluated by the Child Study Team for a possible learning disability or a health problem (poor hearing, poor vision, etc.). 5. Check to see whether the student exhibits this behavior in other classrooms. If he/she does not, you may want to focus on the way you relate to this student. 6. If available and practical, utilize the services of a counselor to assist the child in overcoming his/her reluctance to express him/herself in class. 7. Create a chart listing all students, and give recognition to those who ask questions in class. Emphasize that asking a question indicates intelligence, not stupidity. What can be done for students who frequently shift their attention and/or interests in class? 1. Assign the student some type of classroom responsibility that he/she looks forward to doing(e.g., collecting completed work, delivering messages, etc.). 2. Carefully arrange the student's work area to minimize classroom distractions (e.g., study carrels, room partitions, etc.). 3. Plan individual and/or group lessons that foster the development of analytical abilities in your students (e.g., a step-by-step approach to solving everyday problems). 4. Refer the student to a specialist and/or school nurse to check on visual and auditory deficits. 5. Provide your students with firm but fair classroom rules. Make sure you consistently adhere to the consequences of breaking rules. 6. Use social reinforcers frequently and as soon as possible (e.g., physical nearness or contact, a smile or frown, etc.). 7. Prepare a variety of short lessons to maximize student attention and participation (e.g., manipulation exercises of 15 to 20 minutes in duration). 8. Make suggestions to parents about the possible use of various nutritional diets (e.g., the Feingold diet). 9. Regularly incorporate "relaxation" techniques into the daily classroom routine. Use them whenever the student is in need of them. How do you manage the "hyper" student and the student whose ability to screen out irrelevant stimuli is limited? 2. Eliminate as many environmental distractions as possible. 3. Establish a well-defined work area for the child. This will help to limit outside activities that would detract from his/her concentration. 4. Use classroom aids such as headphones, tachistoscope, videos, etc. Provide for controlled exposures. 6. Incorporate gross motor skills into activities whenever possible. 7. Use bilateral activities, using hands and eyes in the lesson. 8. Make an obstacle course and have the students move through it at varying paces. 9. Use a timer. When the timer stops, students may have a short break. Never use a timer to speed up work, for it will cause tension and frustration rather than increase skill. 10. Use a "time-out" period to reward a hyperactive child who has spent time doing correct activities. What do you do with students who lack motivation, have a very negative attitude toward school, and come to class unprepared? 1. Do everything possible to make sure the physical needs of the student have been met. Has he/she eaten breakfast? Had enough rest? Can he/she see the board clearly, hear clearly, etc.? 2. Make your classroom interesting and stimulating to the students. Make your lessons inviting and challenging, so students are interested in finding out what comes next! 3. Show your students that you take an interest in them. Show that you like them and that they belong in your classroom. 4. Make your lesson an experience that will allow the student to gain self-esteem because he/she is successful. 5. Make goals that are challenging, but attainable. 6. Take advantage of the student's interests and formulate some lessons around them. 7. When developing practice worksheets, use the students' names and some things you know about them to teach a concept (e.g., "Susan expressed her enjoyment regarding her trip to Disney World “when identifying parts of speech). 8. Send home weekly reports to parents. Encourage parents to reward their children for high motivation. 9. Use the concept of students' working together to encourage one another (e.g., cooperative learning groups). 10. Have students chart their own behavior for a week. What methods can be used to motivate students and increase their interest in learning? 1. Use incentives in the classroom to reinforce motivation toward accomplishment (e.g., prizes, stars, or other rewards for completing assignments on time). 2. Get to know each child as an individual, to gain insight into his/her strengths and interests. 3. Hold monthly conferences with students to discuss their work habits, motivation, behavior, etc. 4. Have a real purpose in the school work you assign to your students. Make sure that it relates to their needs. 5. Assist the student in setting realistic goals. 6. Don't always point out errors in a student's work, but show how the finished product can be improved. 7. Provide editing time when you work one-on-one with students to perfect their creative work. 8. Show enthusiasm when you teach. The teacher is the key to motivation in the classroom. 9. Develop special projects for the child whose interests have not yet been tapped by the school routine. 10. Give special recognition through "Student of the Month" or "Star for the Day" designations. What do you do with students who show a lack of respect for adults, peers, their belongings, and the property of others? 1. The teacher should practice the 3 R's: Respect, Responsibility, and Reciprocity. 2. Role-play situations where there is lack of respect. For example: Someone fails a test and others make fun of that person. Follow with group analysis and discussion of the situation and alternative actions. 3. Clearly state the reasons for respecting other people’s property. Publicly acknowledge those who demonstrate respect for others' property, so their peers can model their behavior. 4. Show videos dealing with respect and then discuss them. See Guidance Associates materials. Obtain materials from your county audio library. 5. Don't make unrealistic requests, dictate rules without explanations, or give an ultimatum that presents students with a boundary they might be tempted to cross because they feel it is unreasonable. 6. Listen to each student. Never assume that you know what the student is going to say to explain his/her actions. 7. Show that even though, as the teacher, you are in charge of the class, you respect the student and expect respect in return. What can you do when you are confronted with students who are negative about rational requests and/or rules? a) Involve your class in making up the rules. b) State the rules positively. c) Keep rules brief and to the point. d) Review rules periodically with the class. 2. Arrange private conferences with students to discuss the problem in depth. 3. Ask the student(s) to write down the disturbing behavior in a class logbook. Have them write some appropriate alternative ways of responding to negativity, for future reference. 4. Give students choices, in order to minimize negative reactions (e.g., "Would you rather stay an extra ten minutes and finish the exercise before lunch, or go to lunch now and finish it when you come back?"). 5. Try to have frequent, positive interaction in the class (e.g., praise, group projects, discussions, etc.). 7. Handle difficult students individually outside the classroom, so that there is less chance that others will get involved. 8. Contact the parents, the principal, and/or the counselor to discuss the student's inappropriate behavior.